These are for another swap I'm participating in. I decided to take the plunge and sign up to swap-bot and I'm glad I did. There is such a wide choice of swaps and a low number of swap partners which does not make me feel over whelmed by how many I have to make...................only problem.... I'm now hooked on swaps !!!!!!!!!!!!!!!!! 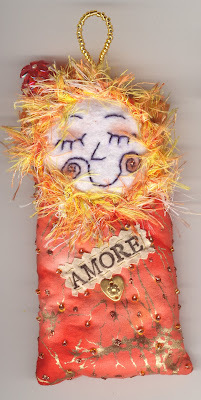 This is a valentine dotee doll I made for a swap I'm participating in. This is the first dotee doll I've ever made and I am now hooked. I've named her TUSCANY due to the colours.